Florida Gov. Haydon Burns ordered his pilots to chase two unidentified lights that were trailing his plane following a campaign appearance in Orlando. 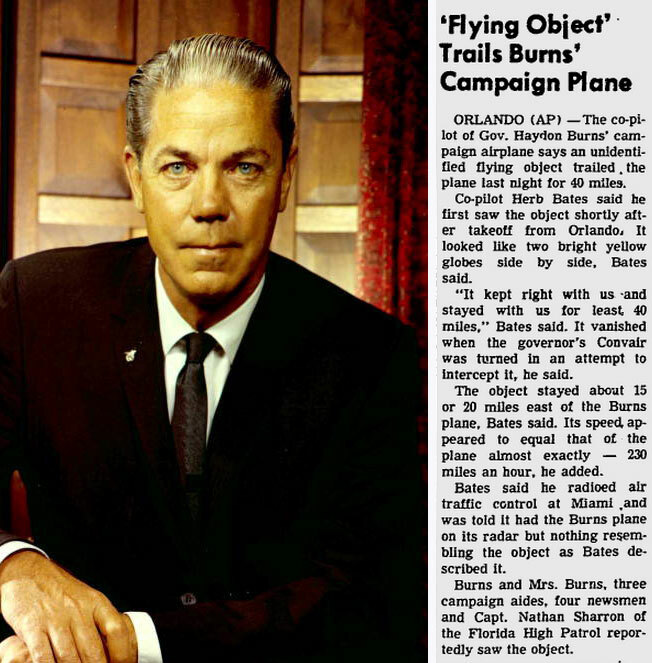 The UFOs were also seen by Burns' pilots, a Florida Highway Patrol captain, six staff members, the governor's wife, and four newspaper reporters on the plane. 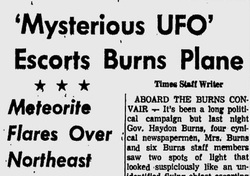 Don Meiklejohn of the St. Petersburg Times wrote that at about 8:52 p.m., Burns shouted, "It's a UFO!" The reporter looked out the window and saw two round lights that were trailing the plane and maintaining its speed. Burns later joked about the sighting, saying, "I told you my campaign would be out of this world." But he confirmed the accounts reported by the journalists. The two lights appeared shortly after the plane took off from Orlando and trailed the plane for about 40 miles as it flew at an altitude of about 6,000 feet at 230 mph. Burns ordered the pilot to turn toward the object, but when he turned, "the lights appeared to rise and then disappeared as though the electricity had been switched off," the Times reported. While the plane's passengers watched the objects, the pilot was in contact with air traffic controllers who said their radar showed nothing near Burns' plane. Coincidentally - or was it? - police in the Northeast reported getting thousands of phone calls from people who had seen a streaking meteorite, and some later connected the Burns' sighting to the meteorite. But that sighting lasted only five to 10 seconds and the meteorite landed in Long Island Sound, according to news reports.